Take time each week to review the upcoming week. Look through the existing appointments and add what has not been noted on your calendar. With your list and calendar, consolidate what is a priority and when you will do it. Weekly planning time gives your the opportunity for a week in review. It’s a time to take a bird’s eye view of what you have coming up and be sure you stay on track. It’s a way to be sure everything is accounted for in the week ahead. Yes, your plan may change mid week. However with a weekly plan you know that priorities will be taken care of. To be sure weekly planning time is accomplished set a consistent time to do this. It could be Friday afternoon toward the end of the work day or Sunday afternoon at the start of the week. Give yourself 30- 60 minutes to be sure you fully complete your planning. Stay on track by writing your weekly planning time in your planner just like other meetings you are attending. 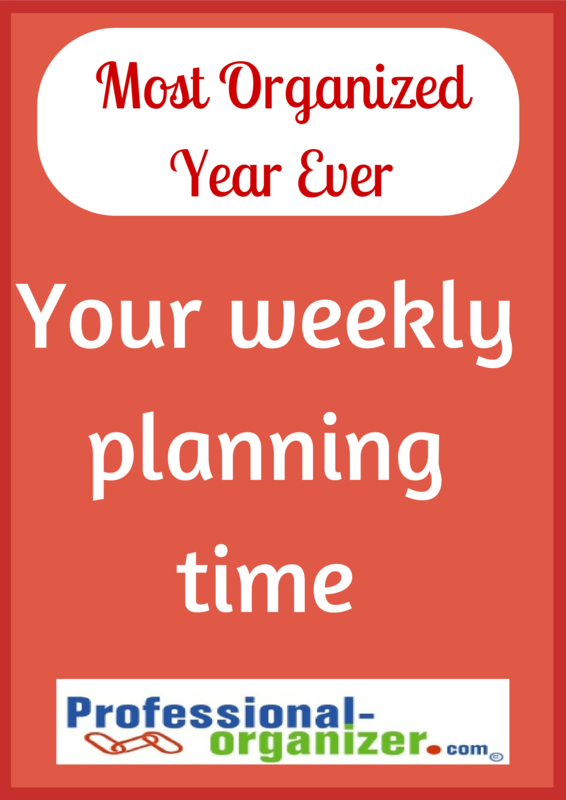 Make this Your Most Organized Year Ever with your weekly planning time. More ideas on time management here! Join my monthly newsletter for more organizing and productivity tips.